Katarzyna Krzyżewska (born on the 28th of April 1962 in Krakow) – a translator from Russian (mainly Joseph Brodsky’s poems), a graduate of Russian philology at the Jagiellonian University. 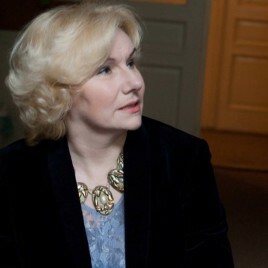 She obtained a master’s degree in 1987 for the thesis “Joseph Brodski – a poet of biography”. Her works have been published in many newspapers and magazines, including Kultura Niezależna, Brulion, Świat, Odra, Znak, Tygodnik Powszechny, Więź, Arka, Arcana, Didaskalia, Zeszyty Literackie, Kresy, Dekada Literacka, Przekrój. She also collaborated with the NaGłos magazine  for many years. Apart from Brodsky’s poems, she has also translated works by Venedict Yerofeyev, Nikolai Berdyaev, Vladimir Zielinski, Georgy Fedotov, Alexander Kushner, Osip Mandelstam, Boris Pasternak, Natalya Gorbanevskaya and Judita Vaičiūnaitė. She also published texts as Seweryn Kuszewski (Brodsky’s play Marbles [in:] Brulion 1988/5-6 ). She has translated Joseph Brodsky’s works for TV channels (TVP, "n"), radio channels (collaboration with Romana Bobrowska) and the theatre (Groteska – the play Yalta). In 1988, she received the Wanda Kragen Award for her translation of Joseph Brodsky’s poem Isaac and Abraham. Czesław Miłosz called her translations “excellent”. Joseph Brodsky Znak wodny [Watermark] Krakow: Znak, 2010 (translation of poems in collaboration with Stanisław Barańczak - essays). Zeszyty Literackie has recently published Urania – a volume of translations of Joseph Brodsky’s poems that includes also 27 translations by Krzyżewska (ZL, Warsaw, 2015).